Election campaign sparring has brought tough talk on crime from the party leaders, ahead of concern for prisoner welfare. After all, safer communities are a hot election issue throughout the land; pleasing 85,000 incarcerated people who don’t have the vote is not. 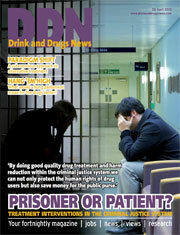 Our cover story this issue (page 6) gives insight to the slow steady progress on prison welfare reform, focusing on health and harm reduction. Practice in other countries in Europe and the US is constantly informing suggestions of radical change in our own criminal justice system. The picture is of painfully slow progress in treating drug-using prisoners as patients and giving them the standard of sustained care we would expect in any drug treatment unit in the community. How important then that we don’t interrupt this progress for the sake of tough talk from the new broom – whoever it should be. Our commentators from EATA encourage a steady view of the prospect of a hung parliament – and by the time you get our next issue, the suspense will be over. Steve Rossell and Katie Hill urge us to offer creative ideas to the parties to influence them on safeguarding services in our sector. If any politician needed convincing of the need to stop issuing knee-jerk reactions to every new drug discovered and address the massive issue of alcohol addiction, they might gain insight from reading Julian’s story on page 11. It’s a sobering reminder that drinks advertising is everywhere and in your face, quite apart from the subliminal messages in every facet of the media. Can you picture a sports team with the name of a drug dealer on their shirts? Politics is an increasingly ludicrous game this week, with the party leaders vying to show muscle against Europe, America, each other, whoever. Let’s hope the politicians don’t lose all continuity in dealing with those who most need them, in their quest to be the party of change.